Textiles can be a second skin. Two new exhibitions, “Common Threads: Weaving Stories Across Time,” at the Isabella Stewart Gardner Museum and “Repair and Design Futures,” at the RISD Museum, explore that intimacy. “True pearl: an opera, in five tapestries,” a deep well of story, association, and history by composer David Lang, with a libretto by Sibyl Kempson and music conducted by Stephen Drury, is the jewel of “Common Threads,” on view through Jan. 13. 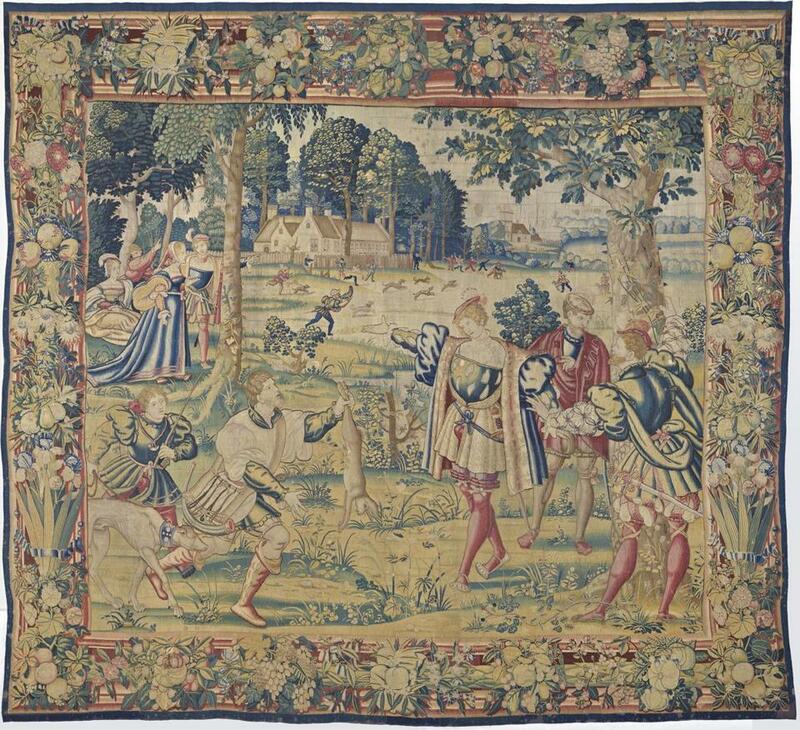 Commissioned for the Gardner’s Tapestry Room, it engages a series of five 16th-century Flemish tapestries and their story of Cyrus the Great, first king of Persia. The opera animates the spirit of the works, and weaves something even larger. The tapestries, works of extraordinary intricacy owned by nobles, were more prized in their time than paintings. Lang and Kempson repeatedly place us within the epic, bloody tale they narrate, then deliver us outside it. Baby Cyrus’s wary, power-hungry grandfather orders the infant slain, and we’re there, bent over the wee boy. Then a woman sings, “The museum is closed, but there are echoes in its hallway,” and we’re back in the grand, dim Tapestry Room. The thefts come to mind, and the ghost of Mrs. Gardner. Such ricocheting feels perfectly natural in the privacy of one’s own thoughts, and “true pearl” is all experienced privately, through headphones. Its sprightly music whispers and chimes, performed by Roomful of Teeth and Callithumpian Consort. The tapestries relate a narrative, and they resonate with their own histories in their Habsburgian imagery (this Persian king is fair-skinned and fair-haired) and in their provenance. It began to hang open after many many years of gravity. And they discovered real pieces of paper with real messages. “True pearl” opens the tapestries wide to let many stories rush through them, and the listener’s private experience becomes another thread in Lang and Kempson’s weave, pulled tight, intrinsic to the art. It’s hard to measure up to that luscious immersion, and the rest of “Common Threads,” in the new wing’s Hostetter Gallery, has an obligatory air, as if assembled merely as a supplement to “true pearl.” Its theme is too broad: How do contemporary artists, inspired by the past, redefine textile art? In many ways, of course — with performance, video, and more. But with only seven artists on view, the effect is shallow. The works engage singly, but they don’t knit together. Their themes don’t overlap enough. Most of the seven artists were in residence at the Gardner, where they prowled the corridors and examined the collection. But the connection seems strained. Raqs Media Collective’s “The Great Bare Mat,” inspired in part by the museum’s pair of Chinese Han Dynasty bronze bears, is a gorgeous, hand-woven carpet shot with lines documenting digital communication around the world. But the bears, brought over from the palace, look lonely and dislocated here. They are made to anchor mats for debates, and in 2013 “The Great Bare Mat” was activated at the Gardner as a debate platform. Here it hangs like a relic. Two other artists, William Kentridge and El Anatsui, are ubiquitous international art stars. Anatsui’s regal, gorgeous piece, “Many Came Back,” is laced with sadness. The Ghanaian artist makes textiles out of metal from liquor packaging, material that touches on consumption, colonialism, and the slave trade. But it feels like a checked box in this exhibition. Mounting a cutting edge fiber show? Get an Anatsui. The most affecting work on view is Lee Mingwei’s “The Mending Project.” Visitors are invited to bring a personal item in need of repair, sit down with a mender, and share the story of that object as it is sewn up. “The Mending Project” gently honors how dear and personal textiles can be. In “Repair and Design Futures,” at RISD through June 30, costumes and textiles curator Kate Irvin brings together damaged garments from all over the world and across three centuries to consider the humility in brokenness, and the love in repair. It’s rare for a museum to spotlight holes, tears, and other injuries. Many pieces are vernacular, whose makers never dreamed of exhibition. A Japanese mendicant monk’s denim work coat is liberally yet artfully stitched to advertise his poverty. A pair of Crow moccasins displays age-old porcupine quillwork and glass beads from European traders. The soles have been replaced with rawhide, recycled from a carrying case. Such clothes carry the sweat and toil of their makers and their wearers: in every rent and stitch, a story. Other objects more intentionally address repair as a concept. Mexican designer Carla Fernández worked with Mujeres Conservando Raíces (Women Preserving Our Roots), a group that harvests cochineals — cactus-eating insects that are the source of a red-pink dye coveted as an export during Mexico’s colonial period. The radiant sleeveless poncho Fernández designed isn’t torn, but it strives to symbolically mend colonialism’s jagged tear. Indigenous Nahua women dyed it; the style predates the Spanish invasion of Mexico.